With your donation today, the end of farrowing crates, the end of all cages, the end of factory farming, comes a step closer. In 2017, we sent undercover investigators into Polish pig farms, and revealed the true horrors of intensive breeding. Confined to a narrow steel cage for weeks on end, in pain and weak from lack of movement, this is sadly and frustratingly the life of nearly a million sows in Poland. Your donation will help change how farm animals get to see the world. 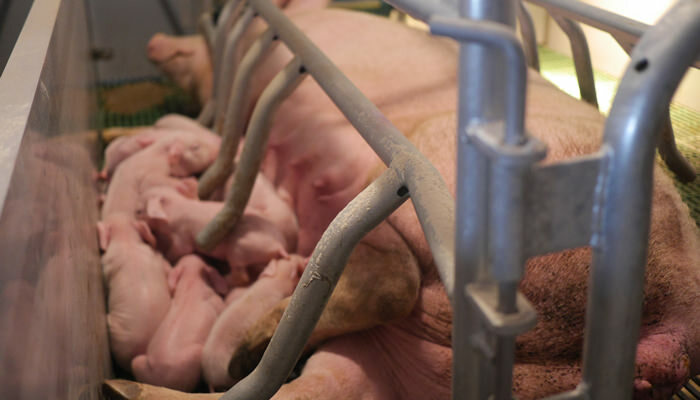 Over 90% of mother pigs who were seen by our investigators were not only trapped in a cage, but also forced to face a wall. Each sow, imprisoned in her crate, was unable to interact with her piglets when she wanted – but she could still hear them squeal. Shockingly, the investigators also witnessed a farmer beat a terrified sow, who was unable to escape the abuse from within her crate. The farmer said this is common practice, to ‘persuade’ exhausted sows, who have just given birth, to eat their food. 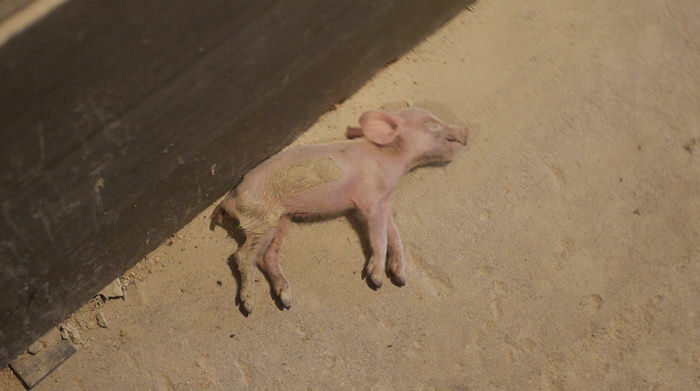 Moreover, our investigators found just-born piglets suffering from hypoxia (oxygen deficiency), who were simply left to slowly die on the concrete floor. This is simply unacceptable. With your donation we can put an end to disgusting, intolerable acts of abuse, neglect and violence towards animals. It’s not just pigs – Poland is the one of Europe’s largest producers of meat chickens, with 800 million reared each year – many in overcrowded and dirty sheds. Plus, in a previous Polish investigation, Compassion exposed the suffering of rabbits reared for meat in cages. Two million animals endure this treatment every year. Instead of feeling ashamed, the Polish Government seems to be proud of this business. They believe more intensive farming will result in more employment and trade opportunities, and poor animal welfare appears to be an acceptable cost to them. They also claim that Poland cannot afford higher welfare systems and that farming on open land simply isn’t feasible. But factory farming hasn’t always been common in Poland. Twenty years ago, small, family farms covered the landscape. And, during their travels, our investigators did come across one traditional farm. It stopped them in their tracks. There were no crates. Piglets were sleeping in deep hay. Sows and piglets were able to interact. And, when a human approached, the mothers could act on their instinct to protect their piglets. The contrast with the fearful caged sows witnessed elsewhere was stark. 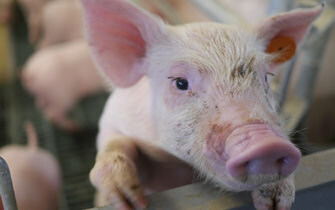 It put the suffering and deprivation caused by farrowing crates into terrible focus. They've already proven that their work, and your support, can make a difference for farm animals. In the spring of 2017, new legislation was proposed that would have allowed live farmed carp, and other fish, to be transported out of water: A direct violation of EU law relating to the transport of animals. But, thanks to immediate lobbying of politicians by CIWF Poland, and over 250,000 emails that supporters sent to their MPs, this new tragedy for farm animals was averted. The legislation was amended, ensuring that fish would continue to be transported in water. 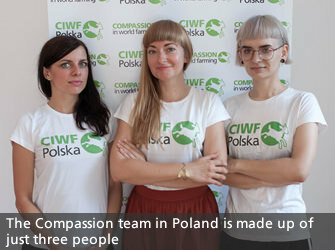 CIWF Poland are fighting factory farming on all fronts. In 2017 alone, your support for them has achieved so much. REACHED OUT: Journalists and celebrities received our Valentine message to End the Cage Age – ‘You don’t need to love them, just have compassion’. MADE THE NEWS: CIWF’s protests against live exports featured on the biggest Polish TV stations and top-two radio stations, exposing a national audience to the cruelty of long distance transport. 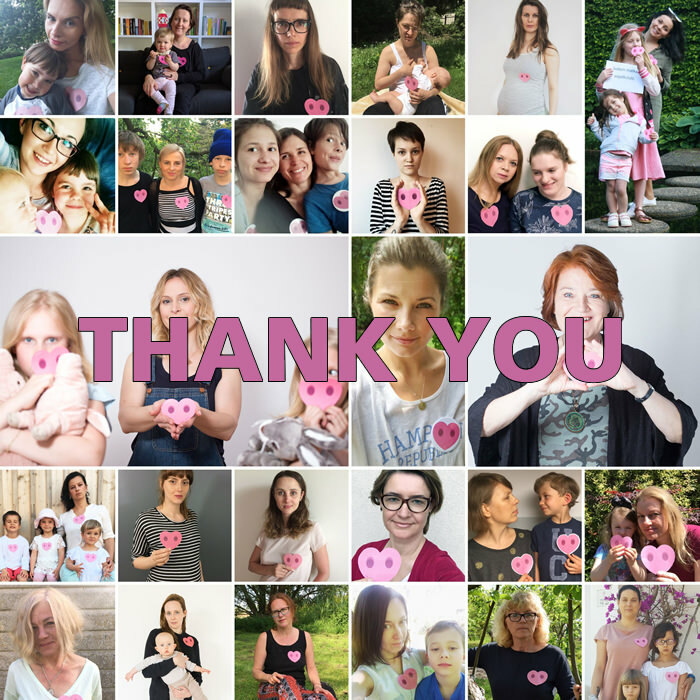 SPREAD THE WORD FOR SOWS: Fueled by the findings from our investigation, CIWF Poland’s Mother’s Day campaign for mother pigs reached more than 400,000 people. Every day, in Poland and around the world, there is urgent work to do because the number of intensive farms are increasing, and new cruelties are emerging. Please will you help combat the growing threats to farm animal welfare with a donation to Compassion today?